Full-sized reprocuction goes up for sale at antiques and art auction at the weekend. 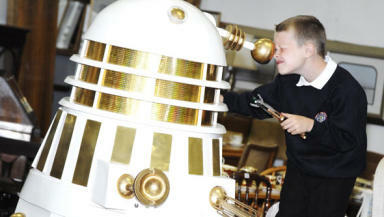 Bidders at a Glasgow auction house get the chance this weekend to bid on an unusual item as a full-sized reproduction Dalek goes under the hammer. The white and gold Dr Who alien has several moving parts, including eyes that light up, and even comes apart to allow the buyer to climb inside and take control. Director of McTear's Auctioneers Brian Clements said: "There have been quite a few double takes since he appeared in our foyer. "It was built by a Dr Who fan and is an exact replica of the Imperial Daleks that appeared with Sylvester McCoy and Colin Baker in earlier episodes of the hit show." The Dalek, which is one of the star lots in the McTear's antiques and art auction on Saturday June 26, is valued at between £450 and £550. The auction also includes more regular items such as a rare Collin-Mezin 1892 violin which could fetch £3000, and four rare cut paper silhouettes by French artist August Edouart. The largest of these is valued at over £2500. Three pieces of artwork by Peter Howson will be going under the hammer, as will a wide range of antique pieces of furniture and ornaments. Other noteable items are an 18th century cast iron cannon that was reclaimed from the River Clyde, valued at between £300 - £500.